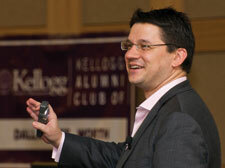 Kellogg and Northwestern alumni clubs of Dallas/Fort Worth hosted their fifth Annual D/FW Career Symposium on Feb. 6. The event was a huge success, drawing nearly 170 business professionals from the Dallas area, doubling the 2009 attendance. This year’s event, which was held at the SMU Cox School of Business, featured several networking opportunities, a keynote speech by Marc Cenedella (CEO of TheLadders.com), as well as 10 breakout sessions led by various industry leaders on topics including "Effective Online Networking in the 21st Century," "Tips from an Executive Coach" and "Applying Business Skills for Impact in Nonprofit Organizations."